Almost half of staff do not feel valued or recognised in the workplace. A YouGov Omnibus poll (13th September 2014) revealed that 45% of GB employees surveyed do not feel valued by their employer. This figure rises to 49% of those aged 45-54. Since the Equality Act 2010, we have seen employers taking more action to develop inclusive workplaces, but as this poll indicates, there is still more to do. NATIONAL INCLUSION WEEK (OCT 6th-10th 2014) is a UK-wide campaign to raise awareness of the benefits of inclusion, to help employers avoid the pitfalls of discrimination and enable employees to reach their full potential. The week provides employers with an opportunity to engage with inclusion in the workplace through a range of creative events and activities. How do we make sure all staff feel valued and employers recognise the full potential of their teams? 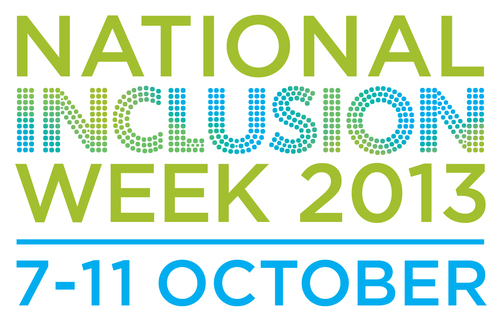 National Inclusion Week is an annual week of activities & events that highlights the value of inclusion in the workplace: 6-10 October 2014.